The Planning Team is to meet Nov. 1 and 2 with Georgia School Board Association and Georgia Vision Project staff to sift through the feedback from the Community Engagement Session held at the Civic Center on Sept. 18 and other data, according to Buck’s report to the Board. Buck said she expected to have a update on work on the Strategic Plan to present to the Board at its next work session on Nov. 5. Buck told the Board that administrators had invited 39 individuals to be on the Planning Team. For the student and staff component, invitations had been sent to an elementary principal, a middle school principal, and a high school principal, Buck said. “We’ve invited two fifth grade students, two eighth grade students, and two high school students,” Buck said. “We’ve also invited an assistant principal, a paraprofessional, a teacher and a district leader,” she added. For the community and parents component, invitations had been sent to one parent per school, based on recommendations from the school principal, Buck said. In addition, invitations went out to business partners, civic, faith, and retiree representatives, elected officials, and the Chamber of Commerce, Buck said. As of the meeting on Oct. 1, Buck said she had not heard back from all of those invited. She said the final group would be made up of between 30 and 50 people, based on guidelines from the Georgia School Board Association. Buck told the Board that data from the Community Engagement Session held on Sept. 18 will be combined with data from a community survey for those who were not able to attend that meeting and made available to the Planning Team. On Nov. 1 and 2, the Planning Team “will be sifting through all of the feedback from the community session, the survey, and other data that we provide for them,” Buck told the Board. “They will be working on developing goals, priorities and performance objectives,” Buck said. Buck said Oconee County Schools is following the protocol developed by the Georgia School Board Association and the Georgia Vision Project, a joint activity of the Georgia School Board Association and the Georgia School Superintendents Assocation. Buck said that the lists of responses from participants in the Community Engagement Session were now in the hands of the Georgia School Board Association. “They are taking the information right now and compiling it into a report for us,” Buck said. That report, which also will include responses to the community survey, should be available shortly before the November meeting of the Planning Team, according to Buck. 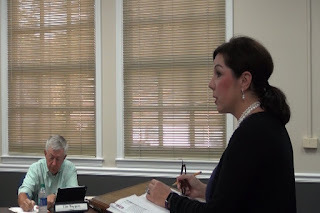 As part of her Teaching and Learning Report to the Board, Buck reported that, based on data from the Georgia Department of Education, Oconee County Schools ranked second in the state in high school graduation rates among school districts with 500 or more graduating students. Oconee County Schools in 2018 graduated 94.4 percent of a cohort of those who entered ninth grade four years earlier, the report showed. The figure actually was down from 96.0 percent in 2017 and 95.6 percent in 2016. The 2018 graduation rate for North Oconee High School was 97.0 percent, while it was 91.9 percent at Oconee County High School. In responses to a question from Board Member Amy Parrish, Buck said that she had done a “very in depth analysis” of the data. “We did have some students that transferred to another district from Oconee County High School,” she said, and for some of those students the school system did not get graduation data. “We also have several that were dropouts that the school had met with numerous times and they still chose to drop out and that counts against us,” she said. Some students simply need more time to complete their studies, she said. “We have really drilled into that and those are the factors,” Buck said. Buck estimated that more than 400 people attended the engagement session held by the school system on Sept. 18 at the Civic Center on Hog Mountain Road. The room was set up for 45 tables, seating eight or nine people per table. When the session got underway, those tables were full, so the 400 estimate is a reasonable one. All five members of the Board of Education were in attendance, as were Board candidates Fran Thompson and Andrea Wellnitz. Thompson and Wellnitz are challenging incumbents Kim Argo and Parrish respectively on the November ballot. Thompson and Wellnitz are Democrats and Argo and Parrish are Republicans. Also attending were Houston Gaines, Deborah Gonzalez and Marcus Wiedower. Gonzalez is the Democratic incumbent in House District 117 and Gaines is the Republican challenger. Republican Wiedower is challenging incumbent Democrat Jonathan Wallace in the 119th House District race. Oconee County School Superintendent Jason Branch opened that session and thanked the members of the community for turning out. He was followed to the microphone by Board of Education Chair Tom Odom, who repeated that message. Stanley DeJarnett, director of the Georgia Vision Project, led the group through the planning process. Those at the tables were asked to indicate school strengths, areas in need of improvement, opportunities for the schools, and threats to the schools. Responses were written on white sheets and hung on the walls around the room at the Civic Center. At the end of the session, participants were asked to review the comments on the sheets and mark which ones were of the highest priority to them by putting a circle on the items on the wall. These were the sheets that Buck reported were turned over to the Georgia School Board Association for analysis. The session lasted about 90 minutes. The first video below is of the Oct. 1 meeting of the Board of Education. Buck’s report begins at 2:06 in the video. The second video is of the Strategic Planning Session of Sept. 18. The entire introduction is included. I edited a few clips from the actual group work sessions together at the end to give a sense of the meeting. OCO: BOE 10 1 18 from Lee Becker on Vimeo. BOE Strategic Planning 9 18 18 from Lee Becker on Vimeo.